I have seen the 1st season and was not disappointed. This anime genre is Shojou, which of course focuses on romance, female leads and smooth animation. It is not your rough, tension, action filled anime so if you want to watch something like that it is not here. This Anime is more of a light hearted humor and romantic drama series. Do watch the 1st season. This show is the best!!! Tomoe can't accept that he has feelings for a little human girl in high school, and Nanami can't help but love him. To me it seems that the more Tomoe pushes Nanami away, the more she loves him... I highly recommend you to watch this show, it's very entertaining as Nanami and Tomoe drags onto thier adventures together! I love this anime! But it is unavailable due to licensing issues in my region. I hope it will become available soon. I know it's gone to a second season as well. I was able to catch it on another free anime website but after upgrading to Windows 10, I cannot even load that site anymore probably due to a firewall issue. 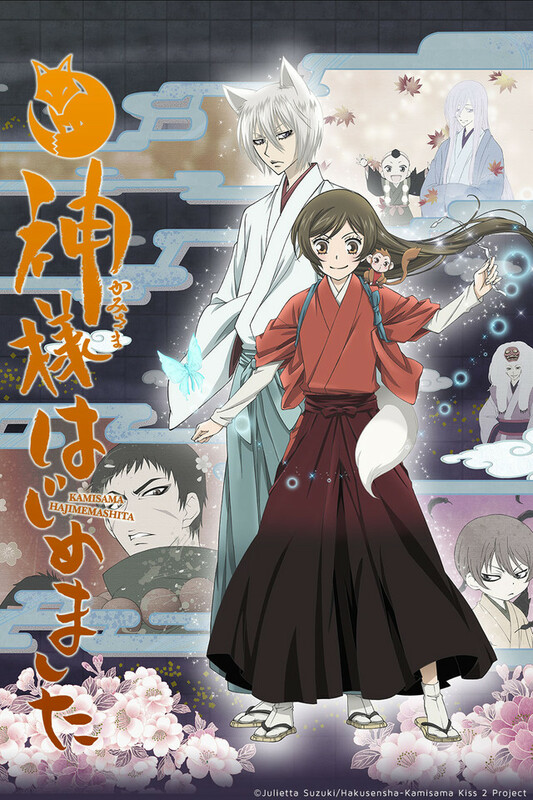 I have seen it up to the episodes in the second season where Tomoe and Mizuki follow Nanami into her memories at the New Year Kamisama's Shrine. I think that's right... been awhile since I've seen it and wish I could watch the series again. Probably my favourite anime of all time. Sometimes the anime you watch is based on your mood. Some days you want action packed, other days something more meallow. However no matter what mood you're currently in, you're definitely in for a treat with Kamisama Hajimemashita. This anime is starts of light and funny but will evolve into a symphony of beautiful feelings and no episode ever feels wasted. This show is so adorable! I love it so much! The characters are fabulous and it is simply a cute, funny show with a great plot! I know season 2 just came out but I need more! I am in search of the manga so that will (hopefully) hold me over for a while until season 3 comes out! I highly recommend it! I don't if I have anything more to add to this show greatness that hasn't already been said, but might as well give it a go. My favorite thing is the dynamic between Nanami and Tomoe. I absolutely adore it. I also love J. Michael Tatum's performance as Tomoe in the dub as well Tia Ballard as Nanami and Micah Solusand as Mizuki. I do find some of the Japanese mythology going on within interesting as I tend to find Japanese mythology, or any mythology in general, interesting to learn about. I also loved it so much that it made me interested in reading the manga to see if other events that weren't adapted may lie beyond. Honestly if a show can do that, you're already at least a nine in my book. I have watched both seasons and read some of the manga, this show is an amazing rom-com. the feel and the characters in the show are all amazing. Nanami is so funny and has an undying love for Tomoe. Also, Tomoe is so cold to her but so sweet in the way he acts. i can't watch this anime T_T it saddens me because i really like it, but for some reason it says that is not available in the region i live in so :c, i really wish i could watch it again but i guess that won't be possible. those who can see it you're so lucky... well bye bye thanks for reading this meaningless review.